For real estate sales, purchase, or rentals both within Cuenca and surrounding areas, you can’t find a better resource and agent than Maribel Crespo. She was more than patient with my requirements – she was truly interested. Her excitement about daily prospects no doubt helped find the perfect place for me. She has an incredible positive attitude, vast connections throughout Cuenca and beyond, maintains a highly respected working relationship with other realtors, and exhibits a deep knowledge of real estate matters. For those that require local language help, she is bi-lingual (Spanish/English). I was impressed by her professionalism, knowledge of many areas, and genuine friendliness. Now that I found her, I would have no other agent handle my real estate business. Do yourself a favor and contact her if you’re looking for just the right place or need to find a motivated buyer. Thank you for all my friends and clients who voted for me for Best Realtor 2017! 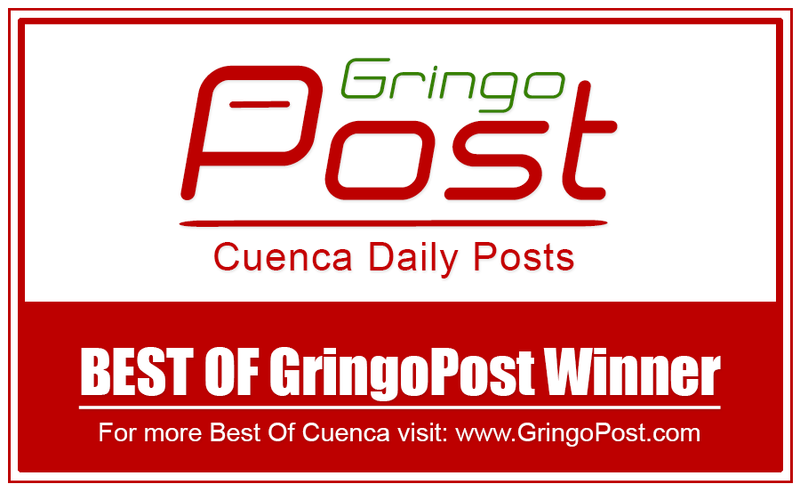 Thank you to the readers of Gringo Post who selected me as the Best Real Estate Agent in Cuenca 2014!!!! Recently we made a 3 week trip to Cuenca to purchase an apartment property. After reading through recommendations on this site we contacted Maribel to help us through the process, and she was extremely helpful with her guidance and involvement. She helped identify other potential alternative properties, provided us with considerations we had not made, and coordinated with the sellers for access to view the properties. Maribel was very responsive, detail oriented, and her communications in English and Spanish helped us navigate the real estate process in Cuenca. Should we be in the position again of purchasing property in Cuenca we would work with Maribel again without hesitation. If you are looking to rent or buy a property in Cuenca or its surrounding locations, I wish to highly recommend Maribel Crespo of Ecuadorable Homes to help you with your search. My sister and I first met Maribel in December, 2013 when we made an exploratory tour to Cuenca and hired her to give us a real estate tour of the city. A native of Cuenca, Maribel knows the city extremely well and she helped us to familiarize ourselves with the various sectors before we located here. After our move in September, 2014, Maribel showed us several rentals and throughout the process, she was very professional and actually listened to what we wanted. When I found out I would have to move again in October, 2015, Maribel was one of the first persons I contacted to help me find an apartment. She is very effective, but not pushy, and she really shows you properties that fit your needs, not just the properties she would like to rent or sell. And, due to her numerous contacts in Cuenca, she is often able to find properties before they come onto the real estate websites, a real plus in the very competitive market in Cuenca. I have friends who have both purchased and rented properties through Maribel, and they have all been extremely satisfied with the process. An added plus for most gringos is that Maribel lived in the US for many years and her English is excellent. I would recommend Maribel without reservation to anyone wishing to find a home in Cuenca. Her website address is www.ecuadorablehomes.com, but not all of her properties are listed on the website. So, you should contact her directly by email or phone for all of your property needs. We are happy to provide a positive referral on behalf of Maribel Crespo as a real estate representative in Ecuador. In her efforts to represent the sale of our Ecuadorian property, we found her to be consistently knowledgable, professional, courteous, responsive and prompt in all her dealings with us. She is sensitive and considerate of the different cultural perceptions that incoming North Americans have in regards to real estate vis-a-vis Ecuadorians. She offers good advice and counsel in dealing with the complex Ecuadorian real estate environment. Without hesitation, we recommend her as a reliable agent. I too would like to recommend Maribel Crespo as an excellent realtor for anyone who wishes to rent or purchase a property in Cuenca. Maribel is one of the most effective realtors that I have ever encountered. The main thing that separates Maribel from other realtors whom we have encountered is her ability to listen to our needs and then work very hard to find just what we asked for. We had encountered other realtors in Cuenca on a previous trip who were more interested in what they wanted to sell rather than what we were interested in. They were not prepared to show us properties that we were interested in, even though we gave them information about our desires prior to meeting with them. This summer Maribel spent time showing us exactly what we were looking for. We found the property we were interested in and Maribel guided us through the complete process. Since we are not moving to Cuenca for a year, Maribel was able to find tenants for one year and has managed the property in our absence. If you are interested in a real estate experience that is truly unique and free of stress, please contact Maribel Crespo at http://www.ecuadorablehomes.com/, phone 098 484 7855, email: maribel@ecuadorablehomes.com. My husband and I came to Cuenca on our exploratory trip in December 2012. Despite the short notice and it being during the holidays, Maribel made time for us and drove us around to give us an idea of properties for purchase and rent. Once we moved here in October 2013, we contacted Maribel right away, and began looking for properties….Maribel had remembered our criteria from the year before and immediately showed us a property which was too good to pass up…we ended up buying it, although we had intended to rent at first. Throughout the process, Maribel was available to us immediately, by e-mail, by phone, and in person. She held our hand, explaining the processes in her impeccable English. We highly recommend Maribel (in fact, relatives of ours are going through the process now to purchase two properties from Maribel) for her work ethic, her non-pushy demeanor, her expertise, and her loyalty. Maribel did not stop helping after we bought the property…she put us in touch with an electrician, a plumber, a handyman, a locksmith, and even helped translate for us when we hired a maid. Moreover, Maribel was helpful in locating a tailor and most recently, a general physician. She is very well-connected and highly regarded in her field, as well as in Cuenca. Thanks Maribel, for helping make our house a home and being genuine throughout the process. Maribel recently sold a condo for me in Cuenca and handled the entire process beautifully! She managed each step efficiently, professionally and with grace. Within 24 hours of listing she posted photos and details on her website. She priced it correctly and actively marketed and showed the property. When the buyer was ready she smoothly managed the process to closing in just a few weeks. Her business practices were in direct contrast to the expat realtor I’d previously listed the property with: He priced it way too high, took 6 weeks to post it online and in 6 months showed the place only twice. Maribel is a STAR! I am so grateful to have found her! I would like to make a long over due recommendation for Maribel Crespo, of Ecuadorable Homes here in Cuenca. I had the pleasure of meeting Maribel in the Spring of ’12. On that exploratory trip, Maribel showed me a large number of properties. I made a decision on one of them, but responsibilities back in the states caused me to put my plans on hold. On Christmas I got a nice greeting from Maribel, and she mentioned the owner/ builder was still interested in doing business with me. Maribel had set me up with a wonderful attorney team on my initial trip, and a deal was made long distance. This was a new construction project, so all manner of decisions had to be made. Through email she sent me pictures of choices to be made in the construction faze. It helps that Maribel has such wonderful taste. She pointed me in the right direction on numerous choices. She dealt directly with the architect and the builder. She was at the building frequently while it was being constructed. I was not fortunate enough be bi- lingual, so I was blessed to have Maribel there as an intermediary. She speaks flawless English. When I arrived back in the Spring of’13, all was had been contracted, and Maribel again aided me in last minute details that all new construction projects incur. I am more than happy, and confident to recommend Maribel for her expertise in the Real Estate field, and all things Ecuador. She also has contacts in every area you will need to make your house, your home! We first met Maribel on our exploratory trip to Ecuador in 2011. Once we decided to come to Cuenca, we sent a very detailed “wish List” to Maribel and asked her to find just the right condo for us. She found exactly what we were looking for, skillfully handled all arrangements for us while we were still in the States, worked with our landlord to arrange for new floors and new double-pane windows to be installed, and made the entire process easy and painless. She speaks perfect English, is punctual, reliable, well-connected in Cuenca, scrupulously honest, accessible, and is always upbeat and positive. She is a delight to work with on both a personal and a business level, and we and numerous friends who have engaged Maribel highly recommend her! Maribel Crespo had the listing on my condo just a couple months, showed it a number of times, and was wonderful about keeping me up to date. She also voluntarily helped me with condo payments and taxes. She went above and beyond and was exceedingly professional throughout! I would recommend Maribel Crespo as a real estate agent! During my time in the U.S. Army I came across a compliment that was used if some one did something extraordinary. It would be said that the person went ‘over and above the call of duty.’ You, Maribel, have done that for me. I deeply appreciate the time and effort you have taken to help me out. We would highly recommend Maribel Crespo to help you find something to buy. She is from Cuenca, speaks English and is very knowledgeable and competent. She helped us find our condo which we bought last winter. Hi Maribel. Hola from Chicago. We enjoyed meeting you, and we appreciated the tour. It really helped us get a feel for Cuenca and the real estate situation there. Maribel Crespo from EcuadorableHomes is a gracious lady and a true professional, who found for me my rental condo at the Palermo. She spent a great deal of time with me, and brought me back to see the condo again when I wanted to refresh my memory a few days later as to whether or not this was in fact the condo of my choice, and how I might imagine furniture layout as well. Maribel setup an appointment and provided translation between myself and the son-in-law of the condo owner, and arranged all the negotiations, copies of the association governance in English and the lease signings, as well as arranged the monthly rental payment with the appropriate bank. She provided transportation, and did a thorough job of responding to all my questions related to the Palermo. What I particularly appreciated from Maribel was the fact that she did not steer me toward properties that did not match the criteria I had set out for her in what I was seeking. I very much enjoyed working with her, and appreciated that she was not pushy in attempting to foist a sale or rental on me. Maribel also has experience in helping in the purchase of property and businesses, serves as a financial consultant, and can be helpful with the assessment of property value. Maribel helped us find the perfect condo in Cuenca and then helped us through each step of the purchase process. Now she has helped us find our second home on the coast. We turn to Maribel to give us good advice and introduce us to people who can provide us with additional assistance. Maribel has been an absolute delight and has surpassed our expectations in virtually every way. Punctual, informed, courteous, committed and effective are just some of the professional adjectives I would use to describe her. On a personal level she has surpassed our expectations many times by doing things far beyond what one would expect from a realtor. She has, in fact, helped us with countless things outside the normal with helping us with information on schools, banks, lawyers, design firms and the many unanticipated details that an American who is purchasing and moving to Ecuador would run into. Beyond all these wonderful superlatives Maribel is also fully bilingual and, having lived many years in the states, has a robust understanding of foreign wants and needs. We have unhesitatingly referred potential clients to Maribel and will continue to do so because we believe in her and have every confidence that you will as well. Maribel Crespo from EcuadorableHomes cares, is knowledgable, and will really find the best for your special requirements! Ken and I want to thank you for your time and effort in familiarizing us with the market here in Cuenca. We have enjoyed out 7 weeks in this beautiful city and look forward to returning next year. We value your thoughts and assistance in finding a rental. We return home with so many good memories to savor and share with our friends and relatives. We wanted to let you know we made it back home safely and without problems. More importantly we wish to send you a very heartfelt ‘thank you’ for all your kindness during our Cuenca, and environs, visit. Your city is very beautiful. The countryside is beautiful. It was a fabulous trip that exceeded all of our expectations. Your thoughtful, and most likely very time consuming, planning is greatly appreciated. Again, we want to thank you for putting together such a complete tour. Showing the city first certainly should help you to sell the properties. For us, understanding more of the city has helped in our decision process. Just wanted to send you a short note about the trip and your services so far. The direction you have taken the tour has been outstanding! Allowing people to get a good feel helps them become More confident to make a buying decisions. Please, no thanks are necessary. You are a wonderful ambassador for your country; you made me fall in love with it. Thank you, Maribél, for the heartfelt introduction you gave us to Cuenca, it was extraordinary and wonderful! I wrote Dan saying your tour was the best that I have been on since I started going to these conferences. I hope to return the second week of October.